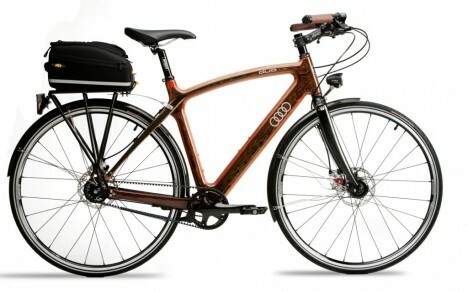 Audi has unveiled its new ‘Duo’ hardwood bike – a collaborative creation between Renovo Hardwood Bicycles and the German premium brand. Renovo is the only all-hardwood bike maker and Audi has commissioned from them a bicycle that will be representative of its luxury and performance brand values. Renovo’s bicycles are designed to offer the smoothest ride of any bike frame material as wood absorbs shock and vibration better than metal or carbon fiber. Additionally, the weight per cubic inch of wood is about a quarter the weight of aluminum, making the duo lighter than most bicycle frames, while still offering equal or superior stiffness, durability and toughness. 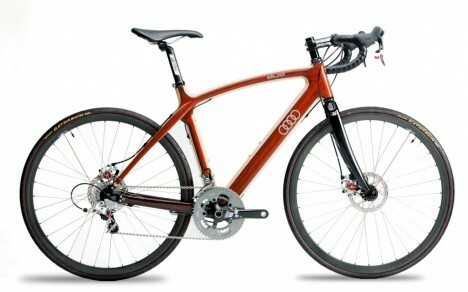 All of the bicycles get Audi’s four-ring logo, and the hardwoods making up the frames were chosen for a specific Audi color scheme. Audi Duo will comprise three bikes: commuter, hybrid and road. The bicycles are priced at $6,530 for the Duo City, $7,350 for the Duo Sport, and $7,460 for the Duo Road. The bikes will be for sale on the Audi Collection website.